For the first three lunar landing crews, the task of getting out of the CM and back to the ship was further complicated because, up to that time, no one really knew whether or not the Moon might be harbouring some exotic form of life that could threaten Earth's biosphere. NASA found itself in the unfortunate position of being unable to prove a negative when government advisers and exobiologists raised the question of possible lunar life. It did not matter that the Moon had already shown itself to be an incredibly hostile, dry, irradiated vacuum. Indeed, some pointed out that its surface had the makings of quite a good steriliser. In the event, what had begun as a small laboratory to handle the lunar samples, evolved into a hugely expensive facility surrounded by difficult procedures for the protection of the home planet. Naturally, the precautions extended to the recovery process. NASA and the other interested parties considered the contamination question for some time before agreeing that the crew would spend 3 weeks in quarantine from their first exposure to lunar soil - this being longer than the incubation period for terrestrial bugs. The first few days were spent in the command module returning to Earth. 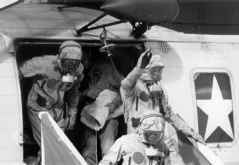 Soon after splashdown, a frogman opened the spacecraft's hatch a little and threw in three coveralls and masks, then disinfected the surround of the hatch. In the cramped confinement of the spacecraft's cabin, and with Earth's gravity further reducing their room to move, the weak-muscled crew wrestled to get into these biological isolation garments (BIGs). In the heat of the equatorial Pacific Ocean, Mike Collins found the BIGs to be dreadfully hot and uncomfortable, increasingly so as the long, drawn-out procedures for appearing to care for the safety of the world were acted out. ''We put the BIGs on inside the spacecraft. We put them on in the lower equipment bay. Neil did first, then I did after him. Buzz put his on in the right-hand seat. We went out; Neil first, then me, and then Buzz. It's necessary, at least the way we had practised it, for us to help one another in sealing the BIGs around the head to make sure the zipper was fully closed.'' The BIGs were dropped after Apollo 11, with the 12 and 14 crews only being required to wear masks. 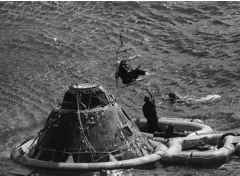 One of the Apollo 14 crew is winched off the life raft in a 'Billy Pugh' net. Note the lack of inflated uprighting bags. The recovery team had arrived quickly before the crew had a chance to inflate them. The Apollo 11 crew exit their helicopter completely enclosed in BIGs. The Apollo 11 crew, wearing their BIGs, sit in the life raft awaiting helicopter pickup. 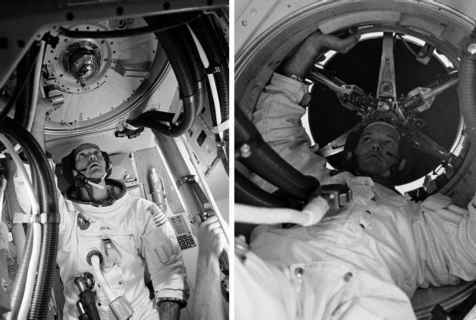 The Apollo 12 crew on board the MQF. Pete Conrad, Richard Gordon and Alan Bean, who has a bandage over his right eye. On reaching the ship, the Apollo 11 crew were not allowed to leave the helicopter. They had to wait while an elevator lowered it to the hangar deck where many of the crew awaited them, along with President Richard Nixon. 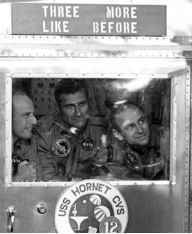 Still cocooned in their BIGs, they strode across the deck from the aircraft and into the mobile quarantine facility (MQF) where they would stay until they reached NASA's expensive lunar receiving laboratory (LRL) in Houston. The MQF was carried to Hawaii, offloaded and driven to Hickham Field, loaded into a C-141 Starlifter and flown to Houston, offloaded and driven to the LRL where the remainder of the quarantine and debriefing was carried out. When the first three crews to walk on the surface of the Moon failed to show any sign of illness, the entire quarantine procedure was dropped for Apollo 15 and subsequent flights. However, these flights had a particularly heavy workload and, on reflection, David Scott wished he could also have been quarantined to give his crew time to wind down. Recovery for non-quarantined crew was a much quicker and easier affair without the worry of planetary contamination weighing down the procedures.